VANCOUVER , Feb. 13, 2019 /CNW/ - IsoEnergy Ltd. ("IsoEnergy" or the "Company") (TSXV: ISO; OTCQX: ISENF) is pleased to announce chemical assay results from intervals of strong uranium mineralization reported earlier (see news release dated January 28, 2019 ) from the Hurricane zone. The highlight is an intersection in drill hole LE19-02 of 3.5 metres averaging 10.4% U3O8 from 326.5-330.0 metres, that includes 38.2% U3O8 over 0.5 metres from 329.0-329.5 metres. 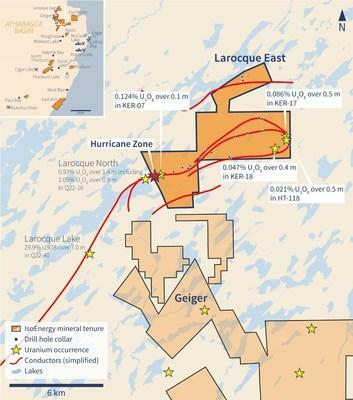 The Hurricane zone is a new discovery of high-grade uranium mineralization on the Company's 100% owned Larocque East property (the "Property") in the eastern Athabasca Basin of northern Saskatchewan. Craig Parry , Chief Executive Officer commented: "I'm very pleased to report these initial assays from our follow-up drilling campaign at the Hurricane zone. With an impressive width, growth along its length, and some very high-grade assays, Hurricane has demonstrated potential to grow into a significant find." Steve Blower , Vice President, Exploration commented: "Our geologists deserve a lot of credit for their interpretation of the geology and rapid identification of the key controls on mineralization. Uranium at Hurricane is related to certain faulted graphitic basement units that form a subtle ridge along the sub- Athabasca unconformity. We will continue to target these structures as we progress along the length of the zone with subsequent drilling."